4-H is a premier ‘positive youth development’ program that helps young people succeed and empowers youth to reach their full potential by engaging them within their communities, schools, and families in a manner that is productive and constructive. It is delivered by Cooperative Extension—a community of more than 100 public universities across the nation that provides hands-on experiences for young people to learn by doing. Children can experience 4‑H in every county and parish in the country—through in-school and after-school programs, school and community clubs, and 4‑H camps. The goal of 4-H is to develop citizenship, leadership, responsibility, and life skills of youth through experiential learning programs and a positive youth development approach. The 4-H name represents four personal development areas of focus: Head, Heart, Hands, and Health. 4-H teaches youth through hands-on “learn by doing” activities that encourage children and teens to experiment, innovate, and think independently. Youth use their HEADS to learn and develop life skills, their HEARTS to support and encourage others, their HANDS to carry out a wide variety of community service projects, and their HEALTH to improve the quality of life for themselves and others. 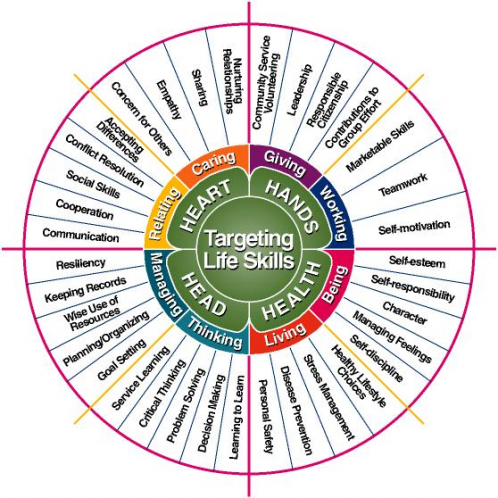 The 4-H Life Skills Wheel contains examples of life skills associated with each H: Head, Heart, Hands, and Health. Recently a team of 4-H Extension and PLT educators from across the country worked together to correlate each of the PLT activities in the PreK-8 Environmental Education Activity Guide to the skills outlined in the 4-H Life Skills Wheel. This PLT / 4-H correlations chart is a handy tool that 4-H Extension Educators and volunteers, as well as other youth development professionals, can use to quickly identify which PLT activities support 4-H life skills. For youth development professionals, the correlations offer a great way to connect environmental education to their goals of positive youth development. Project Learning Tree activities, in addition to building environmental literacy, are great for developing skills like critical thinking, planning, communication, and cooperation. Many of the PLT activities have students working in teams to explore a specific environmental topic. This results in students having to cooperate and communicate with each other, and think critically about a specific environmental topic, in order to complete their task. 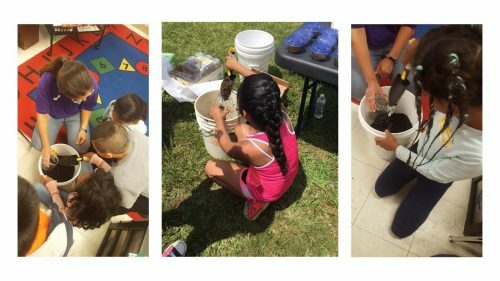 For example, Activity 70—Soil Stories from PLT’s PreK-8 Guide has students working in groups to analyze soil samples and do a soil shake-up experiment, along with solving a soil mystery using data collection. The hands-on, inquiry-based learning happening through this activity is developing youth skills in learning to learn, problem solving, critical thinking, and keeping records (skills associated with the Head). In addition, because students are working as part of a team throughout the activity, it also develops their communication, cooperation, social skills, sharing, leadership, contribution to group efforts, and teamwork skills (skills associated with the Heart and Hands). Project Learning Tree and 4-H are natural partners as we both aim to provide experiential, hands-on learning that results in positive outcomes for youth. Combining both programs can truly enhance experiences for youth. Check out the correlations to see how your favorite PLT activities develop the skills needed for positive youth development. Don’t have the PreK-8 Guide yet? Contact your State PLT Coordinator to find out about upcoming workshops near you or attend an online training. Learn more about the 4-H program and explore 4-H curricula for developing all kinds of youth life skills. Rachel Bayer is a 4-H Extension Agent faculty member at the University of Maryland Extension and is based out of Frederick County, MD, where she provides leadership to the county 4-H program. She is experienced in environmental education, educational program development, and evaluation. Thank you Rachel and all for your hard work with this!!! There is much to know before planting a tree. These STEM lessons help students learn how to plant the right tree in the right place.